We love living here and hope you will too. The location feels rural, yet it's in-town (north end, 5-8" drive into the historic section of Durango, a 30" drive north to Purgatory). You can linger here enjoying the private patio and views or take a sweet walk or launch a SUP at the Oxbow Park & Preserve that is right in front of the property. Take the Dgo to Silverton narrow gauge train ride into the mountains (or wave at the train from your patio). Choose to dine in - a thoughtfully furnished kitchen awaits - or jump to a good nearby restaurant. Pedal out the door for classic road cycling, hike or mountain bike the numerous Durango trails, or ski Purgatory. We love Durango and chose to live here for the outdoor adventures. Mountain biking is a passion, along with gardening, reading, yoga, skate skiing and cooking (well - eating too!) good food. I'm a consultant to the dietary supplement industry (regulatory compliance), and a yoga instructor. My husband is retired. He likes to wrench on bikes a fair bit. This property is a rare find, close to everything (and with river views and access) but situated so that it feels rural. We built it as a duplex, and occupy Unit A. It's fun to meet new people through renting Unit B, and we're happy to share dining and trail recommendations if you are interested. Enjoy the peace and quiet, relish the incredible views and experience Durango. Stay awhile, there's a lot to do! 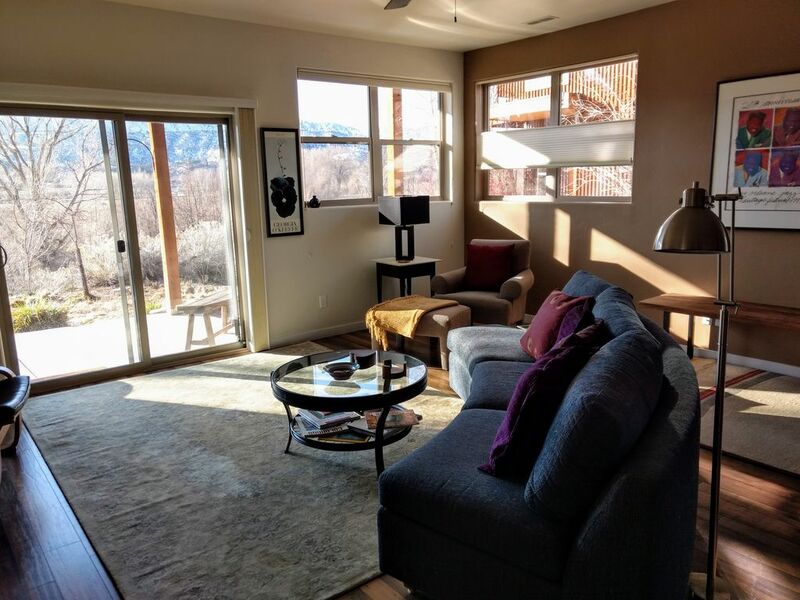 Easy stroll to Animas River and Oxbow Park which is in front of property. Off street, we share driveway entrance with next door neighbors, we park in the garage, so be mindful of not blocking others. It's easy to tuck your vehicle into the spot reserved for you. both bathrooms are outfitted with linens, soaps, etc. French Press or if you wish, Nespresso Vertuoline machine available - bring your own pods or ask us to supply them for you and we'll add to your bill. Like to cook? The kitchen is equipped for you. flatscreen, Roku service, wireless headsets provided. Netflix. private covered patio, bistro table and adirondack chairs, BBQ, river view. You can easily rent SUPs, kayaks, bikes - all the toys. Durango is very keen on toys. Durango offers easy to rent mountain bikes, SUPs, kayaks, skis...you can book a trip on the scenic Durango to Silverton Railway, hike in town or go up in the mountains. The area is also known for fishing and horseback riding. Visit nearby Mesa Verde National Park, a world heritage site. We have great restaurants, a fun music scene and multiple craft breweries. Too much to do, really - you'd better stay awhile! We like to come over and stay here to hike and ride our mtn. bikes in the spring, fall and winter. This property is just right, easy to make it feel like home and the night sky is outstanding. We will return each year! The home and location were everything I was looking for - private, secluded, beautiful home in a perfect location for peace. Sitting in the living room, reading a book, gazing up at the La Sal Mountains sitting just out the back door. What a view! I will be back. When I wanted some activity, only 15 mins to Moab for dining out, shopping, or outfitters. I agree with all the other comments. The photos certainly did not do the views justice - they were incredible. The house is comfortable and clean - the property beautiful. No complaints - highly recommended. This house is an awesome retreat in a perfect location. There is great access to all kinds of fun things in the area. The house is really comfortable, clean, cozy and the perfect temperature all year long. I love to stay here whenever I'm in the area. Thanks Candee! You know you are always welcome. Positioned at the foot of the Rockies, less than 1 hr drive from Mesa Verde National Park (World Heritage Site), the Durango to Silverton Narrow Gauge RR runs through town and by the property en route to one of the most spectacular train rides in the world...world class trout fisheries abound, whether on the Animas River (which runs in front of the property) or there are plenty of lakes (Nighthorse, Navajo, Vallecito, Lemon...), endless hiking, single track mountain biking, gravel roads - you get the picture.